The funky styling of the Chevrolet Spark, plus the low prices - courtesy of the current major discounts on offer - will find favour with many young buyers. Thanks to the discounts, the better engine and LT spec are affordable. Every model shares the same average economy and CO2 emissions (56.5mpg/118g/km). Cheaper versions of the Spark make much more sense to buy. Interested in buying a Chevrolet Spark? Designed to appeal to younger customers, the Spark has sharp edges and trendy front and rear lights. Although every model is a five-door hatchback, because its rear door handles are neatly integrated into the C-pillar, it has the styling of a three-door. However, the basic LS model isn’t as smart as the more expensive models, because it comes with black door handles, mirrors and rear spoiler. Further up the range, these are body-coloured, while the grille surround is chrome, but you need to go for the most expensive LTZ model to get standard alloy wheels. The Spark may have a very distinctive dashboard – with a motorbike-style speedometer and digital rev counter plus a trip computer in a pod above the steering wheel, which move up and down with the steering column – but it’s easy to read. However, the casing looks cheap and you have to reach through the steering wheel to adjust the controls. On the other hand, visibility is good, making the car easy to position in town. Every model also has a height-adjustable driver’s seat, but basic models have a less flexible driving position, as their steering wheel has no adjustment, and even the LT and LTZ’s wheel only adjusts for rake, meaning that some people can find the driving position uncomfortable. There’s a good feeling of space in the front of the Spark – partly thanks to the abundance of headroom – but it’s not so generous in the back, where adults will feel cramped on anything more than a short journey. The boot, too, is tiny, and its 170-litre capacity is less than you’ll find many of its rivals. Fold down the rear seats – 60/40 split on every model – and you have 568 litres to play with, but that’s still less than in many city car rivals. 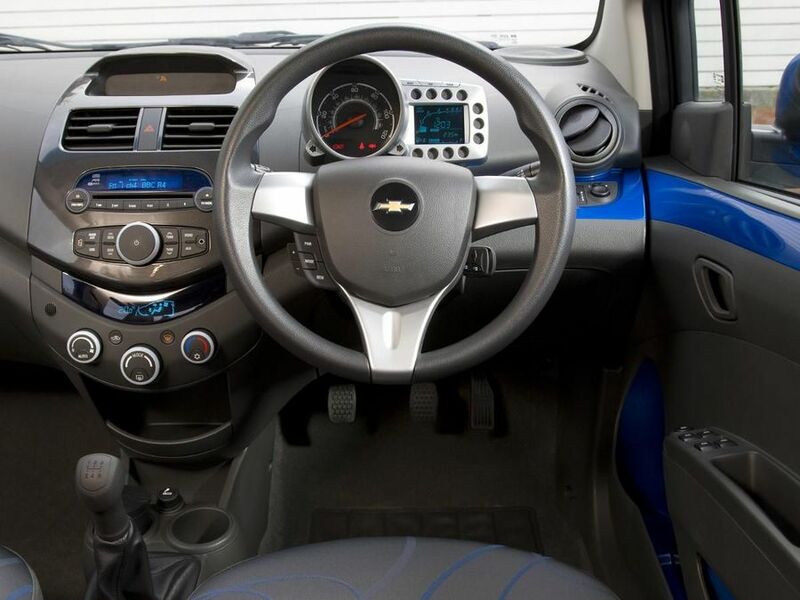 The Chevrolet Spark has a reasonably firm ride, but it won’t send every bump through to the cabin. There is some body roll through corners, but the car finds good grip and feels relatively nimble – partly thanks to the fact that it’s relatively lightweight. However, there’s no getting away from the fact that other city cars provide a better balance of abilities. LS models come with a 1.0-litre engine that feels positively lethargic, but if you go for the LT and LTZ models, you get a more powerful 1.2-litre unit. Its performance is fine around town, but overtaking on faster roads and motorways requires planning – and lots of revs, when the engine becomes very loud. The Spark doesn’t have the cheapest list prices – especially the top LTZ model. But since the announcement that Chevrolet cars will soon cease to be sold in the UK, the company is selling off its cars at very cheap prices – including a couple of thousand off the Spark, which makes it remarkably cheap to buy. We expect that discount will be vital, as it seems natural to expect Chevrolets’ residual values to plummet once the brand leaves the UK market. What’s more, the Spark isn’t that impressive in other areas: its average fuel economy of 56.5mpg and CO2 emissions of 118g/km are bettered by several rivals, and many other city cars sit in lower insurance groups. Despite being a relatively new design, the Spark has not proved very reliable, and both it and Chevrolet as a brand have finished very low in customer satisfaction surveys. On the other hand, however, owner reviews on this site are more positive, with the majority of reports praising the car’s reliability. The Chevrolet Spark scored four stars in Euro NCAP crash tests, only just missing out on a maximum five-star rating. Part of that is thanks to every model coming with the full safety kit, which includes twin front, side and curtain airbags, as well as electronic stability control. Its rear bench seat is fitted with three individual three-point seatbelts, too, with ISOFIX mountings on the outer seats. Thanks to the current discounts, the Spark is one of the cheapest small cars on sale today and all models are well equipped, with a DAB radio and Bluetooth standard across the range. All but the most basic LS model come with air-conditioning, while LT models add a tilt-adjustable steering column and smarter looks, with LTZ models distinguished by their heated front seats, all-round electric windows, wheel-mounted stereo controls, alloys and rear parking sensors. Thanks to the big discounts now on offer, the smart-looking and well-equipped Spark makes some sense as a bargain city car.